Harstine Island is located 16 miles from Shelton, a peaceful little town located between Highways 101 and 3 on the Olympic Peninsula. Harstine Island is the third largest island in the South Sound (after Vashon and Bainbridge) consisting of 40 square miles with 30 miles of shoreline. The island is non-commercial and rural with dense forestation and abundant wildlife. Located on a quiet cove, our cabin is a place to let your cares slip away. 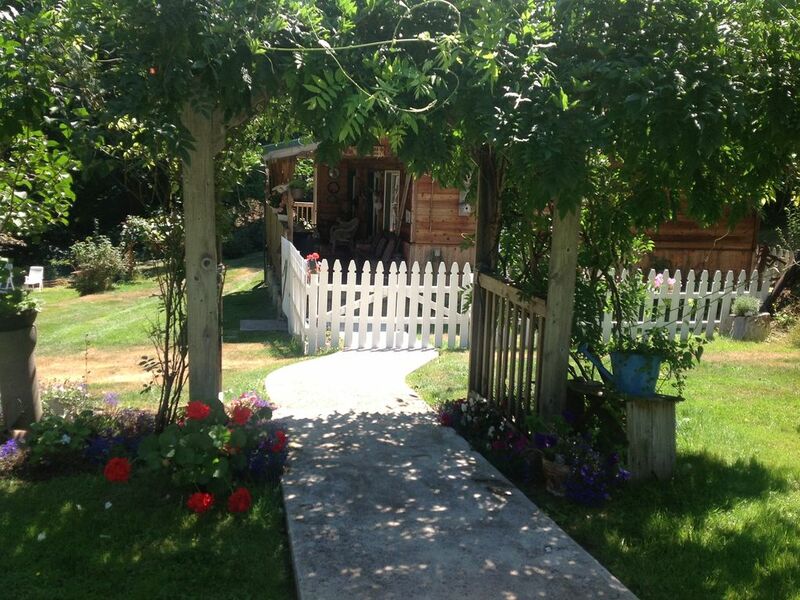 You will love the old fashioned romance of the antique filled cabin on 5 beautiful acres. Two sets of French doors open to a covered porch. From the porch rockers or the porch table and chairs you can watch the tides rise, blue herons take wing and otters pop their heads up to peer at you. Your own private deck with a gas bar-b-que and table and chairs overlooking the saltwater cove. Peaceful accommodations with spectacular views. Rest awhile on a garden bench or on one of 3 large decks overlooking the Puget Sound and the snow capped Olympic Mountains. Complimentary treats frequently appear-scones with homemade jams, hot cookies, muffins, cheese and crackers--whatever the weather or season inspires. Leave the hustle and bustle of city life behind and reserve your special moment in time. Mike grew up in the Tacoma area. Went to Northern Az. University and taught school for 30 years in Yuma, Az. I grew up in Southern Illinois, moved to Yuma in 1968. Mike and I have 6 grown children and 2 very spoiled island dogs. We came to Lacey Wa. for vacations every summer from Yuma, Az. July 3rd, 1988 a cousin brought us to Harstine Island to dig clams. As soon as we crossed the bridge I knew this is where I wanted to live. When we both retired in 1995 we began to fill our dream. If you are looking for a quiet restful cabin surrounded by evergreens and the sounds of nature this is for you! Spend the day digging clams and getting oysters right off the beach. Everything is provided. Spend the evening around your own outdoor firepit. Firewood and marshmallows provided. Enjoy the well stocked games, puzzles and movies. Plush robes are also provided. Washer is in the cabin. Not shared with others. Laundry detergent is provided. Dryer is in the cabin. Not shared with others. Plenty of towels, hand towels and wash cloths. Toilet paper and paper towels are provided. Wood stove is always ready to light upon your arrival. Firewood and kindling provided. There is a comfortable leather sofa, a rattan chair and a cozy recliner. Coffee, tea,salt, pepper, spices , sugar and misc. items in pantry. The cabin has a fully stocked kitchen. 2 bar stools at the counter and 2 chairs at the table. Extra chairs are available. Great collection of books! If you start reading one and don't finish---please feel free to take with you. Lots of magazines on hand. Games and puzzles for children and adults. Cabin has fenced in lawn. There is a garden on the property. When in season guests are urged to help theirselves to fresh veggies, raspberries, blueberries, rubarb and lots of fresh eggs. Private outdoor large firepit. Roast marshmallows, hotdogs or just sit around it and enjoy. Fresh eggs,fresh honey from our own hives,during summer fresh raspberries and produce from the garden. Comfortable, relaxing, great attention to details! Mike & Judy were great hosts! The attention to details was impressive. Judy asked for an ETA so that her fresh baked cookies would be warm when we got there. Along with the cookies was a nice welcome note & there was also a fresh bowl of water for the dogs when we arrived. She also brought us some fresh baked scones, jam, juice & fruit one morning. The cabin was clean, kitchen well stocked. Lots of games and movies to enjoy. Full size washer & dryer. The shower had great water pressure (kinda a big thing for us) The bed was very comfortable with a nice down comforter. Large private property. We really enjoyed our stay and will definitely be coming back! Great little cabin, spotless, perfect for weekend trip. Happy tired dogs a bonus. My wife and I stayed for the weekend with our dog. The island is quiet had great weather to explore the beaches and hiking in the area. The cabin is really cute and had everything we needed to cook meals. I was happy to have some chilly nights so I could build a fire in the wood stove. Judy made delicious treats for us that we enjoyed while we were there. It was a great time and we would recommend to anyone looking for a quiet getaway. Best hosts and the setting is so quiet and peaceful! The cottage had everything we needed. The hosts were the BEST answering any questions, offering suggestions and the treats they had for us were delicious! The setting is beautiful and very peaceful. The cabin kitchen had everything we needed. The beds and bath linens were very nice. I would stay here again! We picked oysters and dug clams for dinner and they were delicious. Judy brought homemade treats also delicious. The cabin was cozy, clean and comfortable. Would recommend to anyone. You can dig clams to steam and pick oysters to throw on the bar-b-que just steps from the cabin porch. Clam digging classes are free on the spot. We have a huge selection of rubber boots and the clam digging tools for your use.